In this episode, we will be about mixing (i.e. 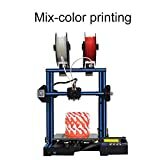 dual extruder / single hotend which you can see more here: diy3dtech.com/Geeetech_A10M_Mix-color_3D_Printer ) 3d printers and why you need one! As I was watch a video the other even where another YouTube / 3D printing enthusiast was trashing the technology a “valueless” I am here doing cool things with so wanted to make this video short video! ← Shop Talk – Stop Tearing Up Your Build Surface!